Yves Lampaert (Etixx-Quick-Step) took stage 1 and the overall lead of the Driedaagse van West-Vlaanderen on Saturday. The Belgian proved the best of a five-rider breakaway, with Tosh Van der Sande (Lotto) second and Sander Cordeel (Vastgoedservice-Golden Palace) third. 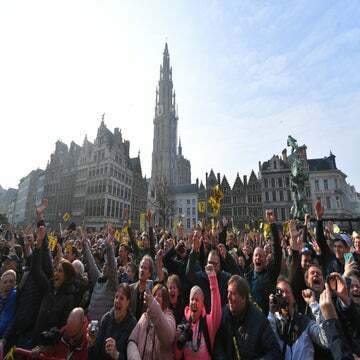 Lampaert and his break-mates, including Alexis Gougaerd (AG2R La Mondiale) and Mirko Selvaggi (Wanty Groupe Gobert), formed the decisive selection out of a much larger group with 57km to go in the 174.1km stage from Brugge to Harelbeke. At the line, the Etixx rider had the most gas left in the tank. Having finished fifth in Friday’s prologue, just eight seconds back of winner Anton Vorobyev (Katusha), the victory also brought Lampaert the leader’s jersey. He also has the lead in the points and best young rider competitions. The second and final stage on Sunday is a 184.5km leg from Nieuwpoort to Ichtegem, and Lampaert hopes to keep the jersey for good. “It won’t be easy with an unpredictable race on a parcours that includes climbs like the Kemmelberg, but the goal is to defend my position as the overall leader,” he said.